One criticism of Roy Beck's Gumball Immigration that hasn't been widely discussed is Beck's lack of consideration for infrastructure in home countries. As many have pointed out, Roy Beck’s Gumball Immigration fails to account for several aspects of why people migrate away from their home country–not the least of which is destruction set upon their infrastructure by more affluent nations to which they immigrate. Since it was filmed seven years ago, Roy Beck’s video about immigration and poverty comes off as a little bit dated. 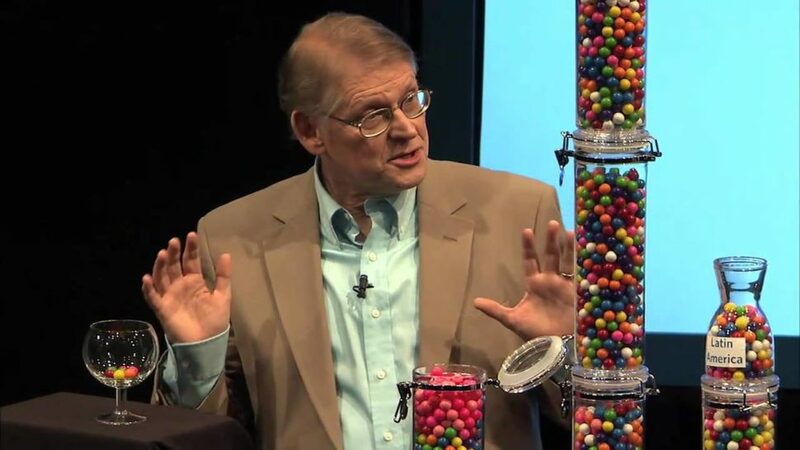 He makes a grand visual analogy with gumballs in order to depict how mass immigration into the U.S. will not solve global poverty, and then argues that people who are devastatingly poor (making $2 a day or less) would have a higher success rate if the brightest individuals weren’t going to the U.S. for opportunities and education. If people stayed in their countries, they could invest their time and intelligence to contribute to that society instead of the U.S. This ignores the practical realities of colonialism and globalization that have wreaked havoc on different societies across the globe, making infrastructural growth seem like a theory not rooted in reality. It also ignores the fact that many immigrants continue to help their families and communities after leaving. Nevertheless, some points that Beck makes about the global poverty epidemic still ring true, given the large scale of the problem and the seemingly insurmountable barriers that need to be broken for people experiencing extreme poverty to find some sort of level playing field. Poverty is relative, Beck explains, the migrants who come to the U.S. are not the most impoverished people in the world, and are generally thoroughly vetted, thoroughly educated, and we have a stake in accepting them into our country because of the talent that they have. To his credit, Beck dispelled the myth that immigrants to the U.S. are migrating in destitute, impoverished masses. Immigrants are beneficial to the economy in the U.S., and many of them are already educated–some even more so than public school taught Americans. Yet, as a result of our educational failings, an immigrant’s education can be undervalued in the U.S. In the end, Beck’s main point was that people who immigrate to the U.S. are “abandoning their countrymen” and should instead consider staying in the country where poverty is a problem so that they can then help be a part of the solution, instead of contributing to the advancement of U.S. culture and infrastructure. This is a great idea. Yet, it assumed that those living in extreme property have the resources to improve their environments at home. The fact that he so causally philosophizes about poverty and the solution to it while using gumballs as an analogy really exemplifies a certain brand of solipsism that is particular to people in the U.S.
People leave their countries because opportunities do not exist there. In many cases, the U.S. and western imperialist tendencies are part of the reason no opportunities exist. Therefore, beyond making sure they stay in their countries and contribute their talents vs. sending them to the U.S., we also must make sure that they have funding, conducive regulation, and economic infrastructure in their countries of origin. Many countries in Africa have a poor infrastructure, despite the continent’s status as the richest continent on Earth with regard to natural resources. Every major lucrative industry in Africa is owned by foreign investors. With regard to just the diamond mining industry, the main profiteers are owned by a range businesses from outside of the continent. Altogether, on the continent of Africa, there are about 20 known diamond mines in operation. Angola hosts three legal mines, though the extent of how many exist in the country is unknown because of war and the success of illegal mining and trade. Currently, the fourth largest diamond mine the world is in Angola. The Catoca diamond mine is majority foreign-owned: the state mining company holds a bit over a third of the company, with the rest split among Russian and Brazilian holdings as well as the elusive Diamond Finance CY BV Group. The companies rake in billions of dollars from this one mine, while only a fraction of the profits benefit Angola. It is rare for one company to have sole control over an entire mine. At the same time, of the top ten richest mining companies, zero of them are from Africa. Angola is a former Portuguese colony that gained independence just over 40 years ago and has endured a long civil war. This means that most infrastructures were built under a colonial, extractive wealth system meant to get goods from the interior to the coast for trade and not for interconnecting the country itself. This also means that what little infrastructure existed was severely damaged or destroyed during the fight for independence, and the subsequent civil war. And even still, before gaining independence, the country was a colony where citizens were forced to into agricultural labor. As a result, the infrastructure that was in place was not one that was necessarily beneficial to the people living there. Knowing this, it should not be surprising that Angola’s economy still closely resembles a colonial economy. That is, despite state sovereignty, most of Angola’s trade worthy resources are majority foreign owned. Of course, Angola still profits off of the mining industry and has the third largest economy in Africa. The country is heavily dependent on petroleum and diamond exports, and 98% of the government’s revenue is reported to be diamond mining-related. At the same time, the country still has an underdeveloped infrastructure. Though the Angolan government is experiencing relative success based off of the use of their natural resources, there is an obvious imbalance in representation when it comes to big business in Angola. The Angolan government and Angolan businesses only reap a fraction of the profits from their country’s own industries. More Angolan businesses will hopefully mean more revenue to use for infrastructure development. Where will Angolans learn the business skills they need to take control of their country’s production? Perhaps through immigration? It is because of all of the Angolan natural resources that there is still a huge investment potential for the country, despite lacking infrastructure. Investors are taking notice as infrastructure development can be its own cash cow. Moving away from a colonial economy that is rife with various legal constraints, investors are beginning to take note of the financial benefits to building Angolan infrastructure. In order to truly benefit from their stake in Angola’s oil, diamond, gold industries, it is essential to invest in the infrastructure. In this way, wealth can once again be extracted more efficiently. Investment in just one aspect of infrastructure will make a huge difference. The hope is that this time around, foreign investment in infrastructure will lead to jobs for Angolans and allow some of the wealth to stay in the country. The more wealth that stays in the country, the more the salaries and standards of living can increase. Perhaps then fewer citizens will consider migrating to another country for better living opportunities. So the USA had a civil war, and became a world super power. Yet I talk to white south Africans who say the blacks will starve because they are forcing out white farmers. Could it be the inherit IQ of the race does have genetic limits and no amount of outside subsidies will get them to Evolve into a stargate atlantis society? Why were cats never used to herd sheep but dogs were? Maybe if we just give the cats enough training and support, they can learn to herd sheep? I recall watching a Chinese construction company talking about building railroads in Africa. He asked his African foreman why did you guys not build your own railroads, worse, you destroyed the railroad infrastructure put into the African country during ww2 times. The Chinese guy said because Africans are all so petty, they will never reach a stargate atlantis level of society because they are too dumb and greedy, inherit to their race. I am not arguing that there is no difference between races and cultures or genders. Several dark skinned Indians subgroups have higher average IQ than the average white. Some tribes in Nigeria are among the highest IQ humans on earth. Whites have at best moderate IQ with high levels of creativity. Blacks are clearly stronger when it comes to muscle mass, which shows in how they excel in different sports. If you studied computer science, you might know that in a genetic algorithm you can only achieve a local optimum and not a global optimum, unless you inter-breed with others which are not part of your local optimum. (The exception being if the global optimum selection occurred by chance, from the start) White European ancestors once mixed with Neanderthals. You need to mix, in order to escape a local optimum. Of course that often means in the short term, you are leaving the local optimum. Unless you are perfectly happy with putting a stop to your group’s genetic evolution, you mix genes as much as possible with the largest possible variety. My point being made in response to your reference of ‘a stargate atlantis level of society’, which I interpret as a global optimum. Because white Europeans have a very high genetic diversity (they are very mixed), we’ve seen more innovations from the European culture. But also population density contributes to success. The more we encounter new ideas, the faster we progress. Cities are evidence of this phenomenon. Because Europeans fought over the same piece of extremely fertile, desirable land for ages, the population density has been higher in Europe for a longer period of time, which contributed to the explosion of knowledge. As you see, there’s a lot more at play than the color of your skin. But why should black Africa be judged toward white or Asian cultural standards? I can make the argument that they were more successful than Western society, in that they are not ruining the very earth they live on, but learned to live in harmony with nature. Where-ever the white culture has gone in history, there is a trail of destruction (and railroads) along with progress. The reason they don’t maintain the railroads, is because their culture had no interest in it, it was forced upon them. So it has less in common with intelligence than culture. Now I’m of the belief that we should respect other cultures and that each culture has the right to borders, and protect it’s culture and values. If all things are “equal”, then there is no diversity by definition. Thus the agenda of enforcing equality is the enemy of diversity, and in my opinion, racist. I prefer to love each culture, and not think of myself as superior. Multiculturalism has failed in Europe, but in America it has largely succeeded thus far. I think the explanation is that the difference is that the gene pool Europe is attracting is the well-fare immigrant (high degree of social support), and the gene pool America is attracting is the American dreamer (low degree of social support, high degree of economic freedom). Thus America’s culture is one of exceptionalism, where we recruit from among the best and brightest from all nations, to their national detriment, and our national benefit. This is a difficult topic, and that’s how far I’ve gotten in terms of understanding the issue so far, although I’m learning every day and open to be corrected. But William, your post can easily be offending people, and that’s not okay. Dogs and cats are two different species, humans are one species. The human family is infinitely more gifted than any other species, and we share common ancestors thus we are brothers and sisters. There is so much to love about each other that there’s no point in being unloving, and feeling right in our narrow viewpoints. Specifically I read in tricycle that those who PERCEIVE an offense, may do more damage than those who they FALSELY assumed intended offense. If someone else gets angry and offended, sounds like their personal problem that they need to work on, maybe being offended often is a racial failing of thiers. You BIT (pun intended) the line I laid out for you on the dog/cat issue, it seems Africans are more related to bonobo monkeys than to euro americans. http://www.dailystormer.com/black-africans-are-genetically-closer-to-bonobos-than-to-white-humans/ So now if you concede this point it seems you are trying to bring bonobo monkeys into an advanced stargate atlantis society, and they simply don’t have the IQ to function there. Like teaching a cat to herd sheep, just seems silly to even try.